Directions (1 – 5) Study the following information carefully and answer the given questions. Seven students Nancy, Nikita, Nikki, Nalani, Nirmala, Natasha and Nivan are studying engineer from different fields Civil, Mechanical, Electronics, Chemical, Aeronautics, Computer and Automobile but not necessarily in the same order. All the seven students have practical class on one of the three different days of the week, via Tuesday, Thursday and Saturday such that not less than two students have practical classes on the same day. Nikki and Nirmala do not have practical class on the same day. Nivan studying Aeronautics and not has practical class same day as Nikita. Those have class on Tuesday not studying Automobile and Electronics. Nikita is not studying Chemical but has practical class on same day as Nirmala. Natasha has practical class on Thursday only with Nalani, whose field is Civil. Nirmala is studying Computer. Nancy is studying Mechanical and has practical class on Saturday. 1. Natasha studying which of the following field? 2. Nivan has practical class with whom among the following? 3. Which of the following combination is definitely true? A) Natasha – Electronics – Thursday. B) Nancy – Mechanical – Thursday. 4. Which of the following pairs of practical class on Tuesday? 5. Which of the following group of students have practical class on Saturday? Directions (6 – 10): Read the following information carefully and answer the questions. P, Q, R, S, L, M, N and O are eight boxers of different weight categories. There are two persons of flyweight category. They all have different ranks ranging from first to eighth but not necessarily in the same order. They all are sitting around a circular table facing to the centre of the table. No two boxers have the same ranks. 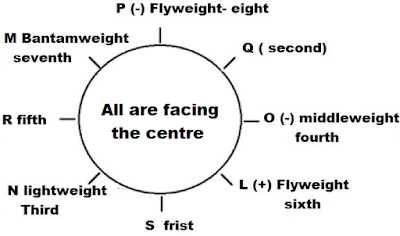 Q is third to the right of S, who is seated opposite to P. The fifth rank holder and M are not near to O and S. Eighth rank holder form flyweight category is third to the left of third rank holder from lightweight category. The sixth rank holder is opposite to M who is from the bantam weight category, who is not second rank holder. Fifth rank holder is not P, M is opposite to one who is near to S. The one having first rank is sitting exactly between the third rank holder and L. There is only one boxer sitting between N and sixth rank holder. There is only one boxer sitting between seventh rank holder and second rank holder but she does not fight in lightweight category. O is fourth rank holder and not near to S but she is from middle weight category. The boxer from flyweight category does not have an odd rank but he sits second to the right of N.
6. Which of the following boxers is from flyweight category? 7. Who is seated third to the left of sixth rank holder? 8. From the following five, four are alike and make a group, find that which one does not belong to the group? 4. Which of the following statements is true regarding O? 10. In which of the following weight categories does R fights?